Washing: Washing your duvet cover in warm water; with a gentle cycle with covers inside out and all zippers closed is recommended. Tumble dry on a cool heat setting and remove promptly at cycle end. Touch up with a low-midrange temperature settings. Cold to cool water will aid in maintaining the colour of all linens. Use detergents that do not contain bleach, such as Nellie's All Natural products. If not using a liquid detergent, dilute soap powder with water to avoid soap residue. Do not overload the machine. Only wash with like colours. Do not wash other items with your linens. Avoid fabric softeners as some may cause fabric discolouration. Some medicated creams, tooth whiteners, perfumes, and hair products may cause fabric discolouration. Carefully read contents on all packaging of the above mentioned to avoid damage to your fine linens. Drying: Use dryerballs, such as Nellie's® Lamby Wool Dryerballs, to reduce drying time, soften fabrics and reduce wrinkles. Remove linens promptly from washing machine at cycle end. Shake out and place in dryer. Do not overload the dryer. Linens should be able to tumble freely. Set dryer temperature as indicated on care tag. Avoid fabric softening sheets as some may cause fabric discolouration. Do not over-dry your linens. Remove promptly at cycle end. Both Bamboo and TENCEL® fibers are created from natural plant cellulose. These two yarns are blended with natural cotton allowing for more comfort, better durability, lower shrinkage and excellent colourfastness. Be sure to always wash your Bamboo and TENCEL® blend fabrics in cold water. Do not use bleach. Tumble dry on low heat and remove promptly from dryer. Do not over dry. Do not use fabric softener sheets when drying. Bamboo and TENCEL® blend fabrics tend to wrinkle less than cotton. If desired use an iron at a medium heat setting. Do not dry-clean. See Basic Care Recommendations for further details. Those who prefer 100% cotton know that a bit more attention is required in their laundering. Use cold water and the gentle cycle. Use a detergent without bleach. For darker colours add 1–1½ cups of white vinegar or ½ cup of salt to wash cycle with each laundering. This will aid in colour retention. Do not over-dry. To minimize ironing, remove promptly from dryer. For a crisp press, iron while slightly damp. See Basic Care Recommendations for further details. Luxurious jacquard fabrics offer a custom look to your bedroom decor. With proper care these linens will last for years. 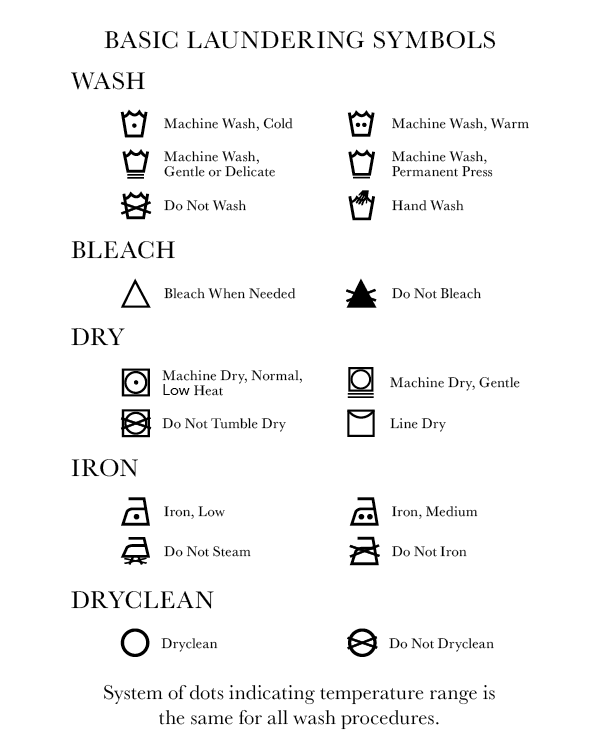 We recommend cold water wash on gentle/delicate cycle with a mild washing solution such as Woolite or Zero. Refer to care label on each item for specific details. Do not bleach. Turn duvet cover and shams inside out to protect any trim details. Hanging to dry will prolong the life of these fine linens and eliminate the need for pressing. See Basic Care Recommendations for further details. The more linen is washed, the softer and more luminous it becomes. Launder whites and colours separately. White linen may be washed hot, and colored linens should be washed at medium temperatures. If tumble drying, do not over dry and remove from machine when slightly damp. If needed, while still damp, use a hot iron on the wrong side of fabric. Ideally linen should be hung to dry as it will last much longer. Do not dry-clean. All of our flannel linens are 100% cotton. There is an allowance for shrinkage on all products. Excess lint is as characteristic of flannel and after the initial 3–4 laundering, most will be eliminated. Before first use, wash flannel sheets in 1 cup of white vinegar instead of laundry detergent or add 1 cup of white vinegar into the rinse cycle. This can help reduce pilling and prevent future pilling. Lint loss is a characteristic of brushed flannel. Use lukewarm water and a lower dryer setting. Do not bleach. It’s important not to overload the washer or dryer when caring for your flannel linens. See Basic Care Recommendations for further details. A duvet cover will prolong the life of the duvet and eliminate the necessity of frequent washing. PRIOR TO USE: Down duvets are vacuum packed at the factory and therefore do not appear as fluffy as the store sample does. To activate (fluff up) the down shake your duvet for a few moments. Full lofting of the down will usually occur within 24 hours. Your body warmth will enable it to loft even more. A duvet cover is recommended with all duvets in order to prolong the life of the duvet and eliminate the necessity of frequent washing. GENERAL CARE: Change the position of the duvet within the duvet cover with each duvet cover change. This will ensure even wear, as there is more abrasion and soiling at the edge closest to the face. Air out your duvet periodically away from the sun’s damaging rays. This will freshen it, and optimize the duvet’s insulating properties. Small spots and stains can be spot cleaned. Shift as much down as possible away from the stain. Spot clean with a non-detergent solution (such as woolite or zero) diluted with water. Rub fabric to loosen stain, and squeeze excess moisture out with a dry towel. Rinse the same way using just water. Use a hair drier to ensure area is completely dry. WASHING: With careful use, a down duvet should only require washing every 5 to 10 years, if at all. A small duvet can be laundered in a domestic front load machine. Larger sizes will require a commercial front load machine. Set the washer on gentle or delicate cycle and use a cool water wash and rinse. Set the machine to the maximum load capacity and add an appropriate amount of non-detergent liquid soap (such as woolite or zero). Allow the machine to fill and the liquid soap to dilute. Do not use any type of fabric softener. Submerge the down duvet into the water spreading it evenly. Allow the cycle to complete, and then put through a second rinse cycle. This will ensure all soap residue has been removed. DRYING: Drying the down duvet is time consuming; it must be done at the lowest heating setting. High heat may cause the shell to shrink. Shake the duvet prior to putting it in the dyer to fluff up the fill. Place the down duvet in the drier, and tumble at the lowest heat setting until dry. The addition of dryer balls or couple of white towels with a clean tennis shoe will keep the duvet moving and help to draw out some of the moisture. Frequent checks should be made to ensure the down duvet has not clumped to one side of the drier. Several times during the drying process remove the down duvet from the dryer and shake. This will aid in fluffing up the fill and ensure all parts of the duvet are drying evenly. The final bit of drying could be done by air-drying the duvet. Be sure the duvet is thoroughly dry before using otherwise mold or mildew could possibly form inside the duvet.